1.1 What is a VPN? A VPN, or virtual private network, is a solution designed to meet the need for secure access over the Internet to resources on a private network. By using encryption and other security mechanisms, a VPN is able to provide a secure and reliable private connection between computer networks over the Internet. By using a VPN, employees of a business will be able to safely access and use their company intranet over an existing Internet connection as if they were directly connected to the network. Individual users will be able to use a VPN to safely access their home network remotely while away from home. 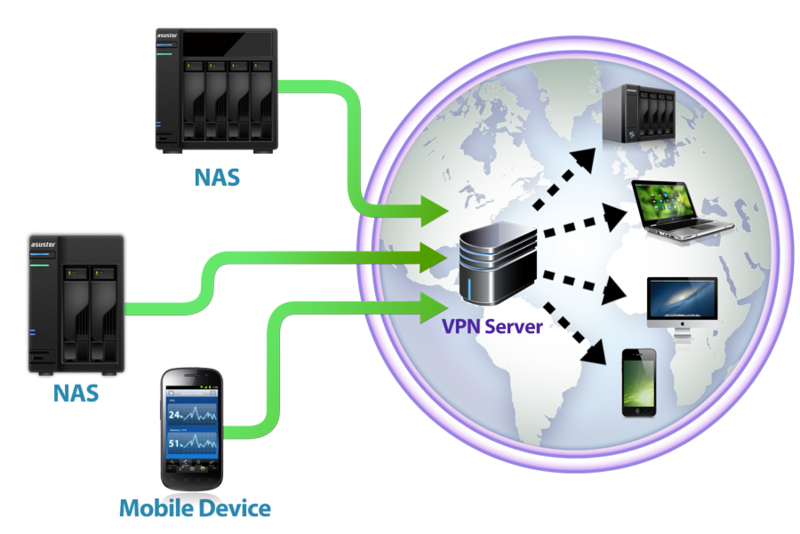 Your ASUSTOR NAS can act as a VPN client which can then connect to VPN servers via PPTP or OpenVPN protocols allowing you to gain access to different virtual private networks. ASUSTOR NAS also supports the creation of multiple VPN connection profiles allowing you to easily switch connections between different VPN networks. In the following example, we will guide you through the process of connecting your ASUSTOR NAS to a VPN server via PPTP protocol. Log in to ADM using your Web browser. Select [Settings] > [Network] > [Add] > [Create VPN]. Select the [PPTP] radio button and then click [Next]. Fill out the required fields and then click on [Finish] once you are done. Note: You also have the option of clicking on the [Advanced] button to make additional configurations. After clicking on the [Advanced] button, you will be given options to configure different types of authentication, encryption and whether or not you want to reconnect if the VPN connection is lost. PAP: The password will not be encrypted. CHAP: The password will be encrypted using CHAP. MS CHAP: The password will be encrypted using Microsoft CHAP version 1. MS CHAP v2: The password will be encrypted using Microsoft CHAP version 2. No MPPE: The VPN connection will not be protected with any encryption mechanism. MPPE (40/128 bit): The VPN connection will be protected with a 40-bit or 128-bit encryption mechanism. Maximum MPPE (128 bit): The VPN connection will be encrypted with a 128-bit encryption, providing the highest level of security. Click [OK] once you are done. The VPN configuration that you have just set up will now be visible in the configurations list. Make sure that it is selected and then select [Action] > [Connect] to start the connection. In the following example, we will guide you through the process of connecting your ASUSTOR NAS to a VPN server via OpenVPN protocol. Select the [openVPN] radio button and then click [Next]. Select the [General Settings] radio button and then click [Next]. Fill out the required fields and then click on [Finish] once you are done. You can click on [browse] to import the certificate (ca.crt) exported from the OpenVPN server. After clicking on the [Advanced] button, you will be given options for the cipher, authentication, enabling compression on the VPN link, routing all client traffic through the VPN server and reconnecting when the VPN connection is lost. The VPN configuration that you have just set up will now be visible. Make sure that it is selected and then select [Action] > [Connect] to start the connection.